Europeans have an absolute passion for gaming of all types, but their clever card games are among some of the best in the world. 6 Nimmt, No Thanks, Cockroach Poker, and Coloretto are light, fun, and easy to teach and play…not to mention portable. 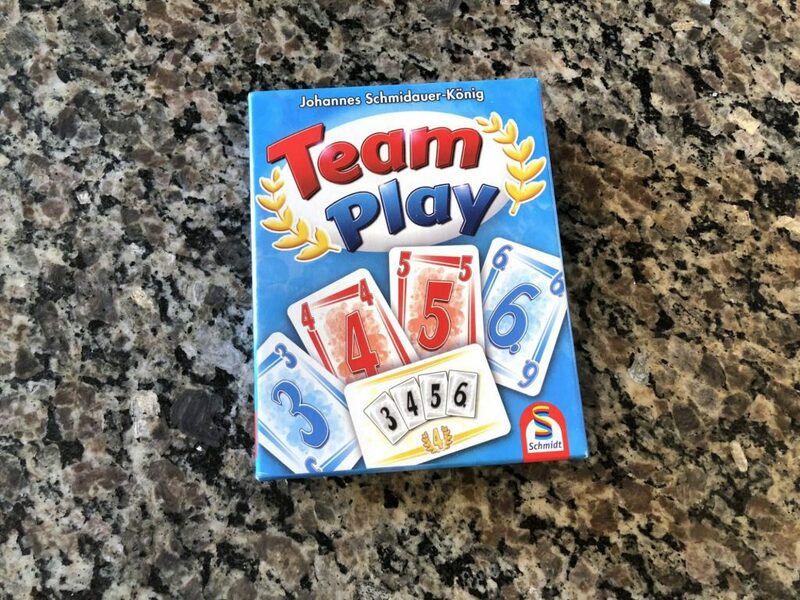 So when I heard about Team Play from designer Johannes Schmidauer-König and publisher Schmidt Spiele I knew that I had to have it. This game will appeal to anyone who loves games like Hearts, Bridge, Canasta, or Rummy. 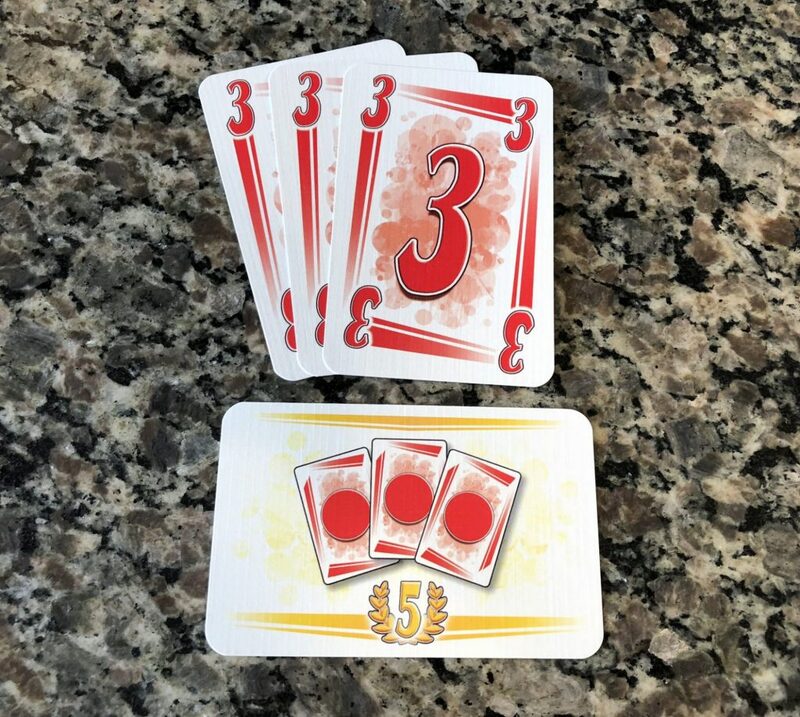 While it does play odd numbers (3 and 5), you’ll want to make sure you sit across the table from your favorite partner before you start the game. 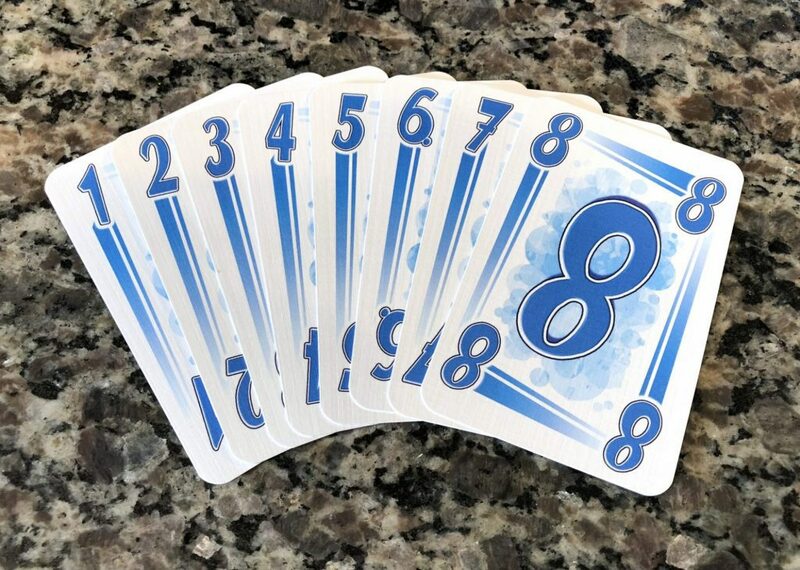 In Team Play, each team is trying to be the first to complete 8 missions by turning in cards from their hand which match the patterns on the mission cards. Each player has a single mission card in front of them, and all players share a single public mission card which anyone can complete. Setting up Team Play is quick. Simply shuffle the number card and mission card decks separately. Deal 1 face up mission card to each player, and one to the middle. The player to the left of the dealer receives 1 number card, the next player receives 2 cards, then each subsequent player receives 3 cards. Deal another 3 number cards face up in the middle of the table and you’re ready to start. There are 64 number cards ranging in value from 1 to 8, in both red and and blue. The mission cards are at the heart of the game, so let’s take a few minutes to look over some of the possibilities. A mission card is complete when the active player is able to play a set of cards from their hand which fulfill the pattern shown on the card. There are 46 mission cards which range in points from 1 to 6, and increase in difficulty with the point value. Any time a mission card shows a blue or red number or symbol, players must play that color card to fulfill the requirements. If a mission card shows a black number or symbol, this means that any color can be used for that mission card. Some mission cards will require a player to discard a “straight”, or a number of cards in sequential order. Other cards require the player to discard three of a kind, in red, before they earn those points. 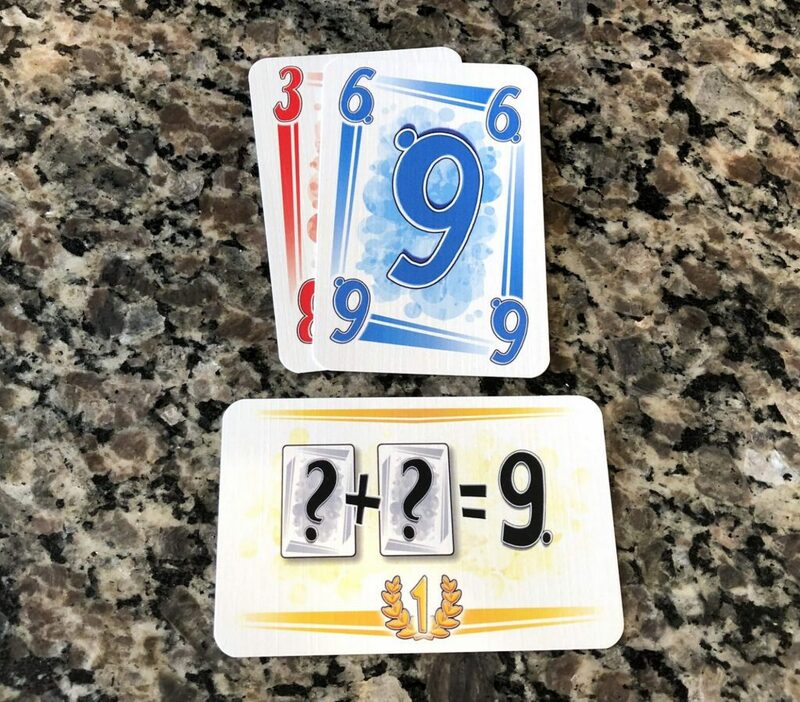 Yet other cards require a player to play exactly two cards of any color which add up to 9. Mission card – two cards of either color which add up to nine. Throughout the game players will be presented with a wide array of different icons and symbols in the requirements for other mission cards: pairs and triplet sets, even and odd cards, and straights or flushes. The rules include a handy reference showing which icons are what, but after a game or two reading the cards will become second nature. On their turn a player must first discard down to 6 cards, then draw 2 cards from either the top of the draw pile, or from the face up cards (which are immediately replaced). 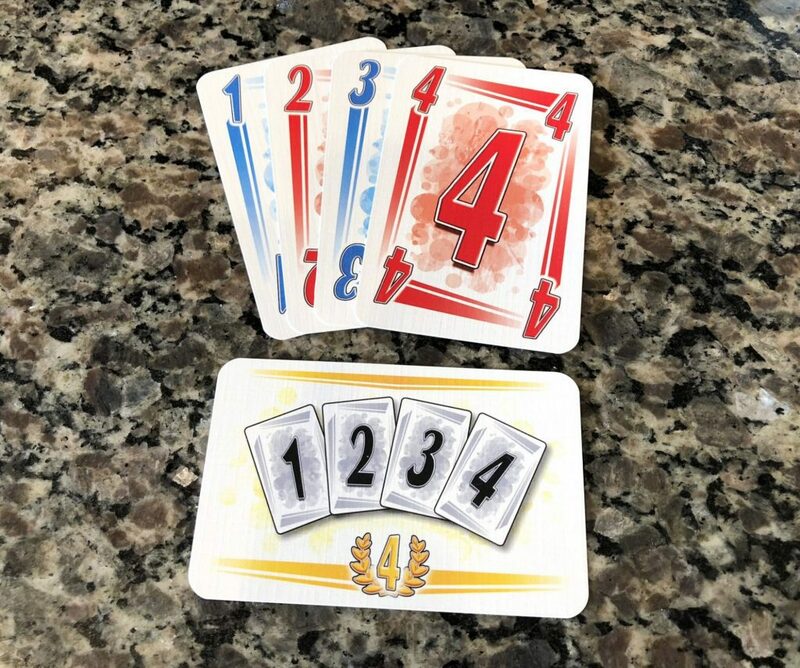 Players can then choose to fulfill one or more mission cards for their team by discarding the appropriate number of cards from their hand. 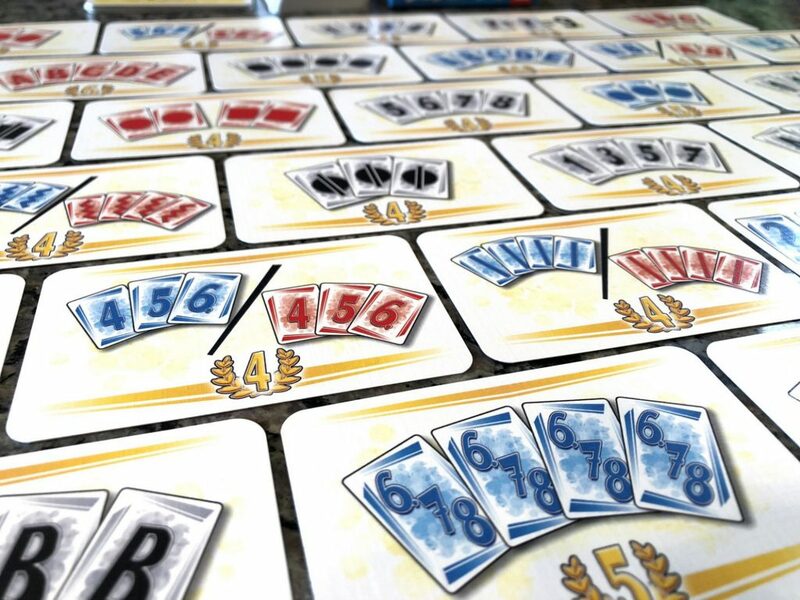 Just before their turn is complete, players may choose to pass 1 or 2 cards from their hand to their partner. You’ll need to pay attention to your partner’s card draws though as there’s no discussion about what cards your teammate might need, or wishes they had. My wife prefers games which don’t require her to strategize about the game when it’s not her turn and which allow her to socialize with other players. Games like Five Crowns or Canasta Caliente are right up her alley, so I knew she’d like Team Play as well. There’s only a few minor issues I have with the game, and it’s most likely one of translation. There’s a few spots in the rules which aren’t very clear about how to play, and one specific spot where the rules give a conflicting instruction. After examining the steps more closely my group was able to puzzle out the true meaning. 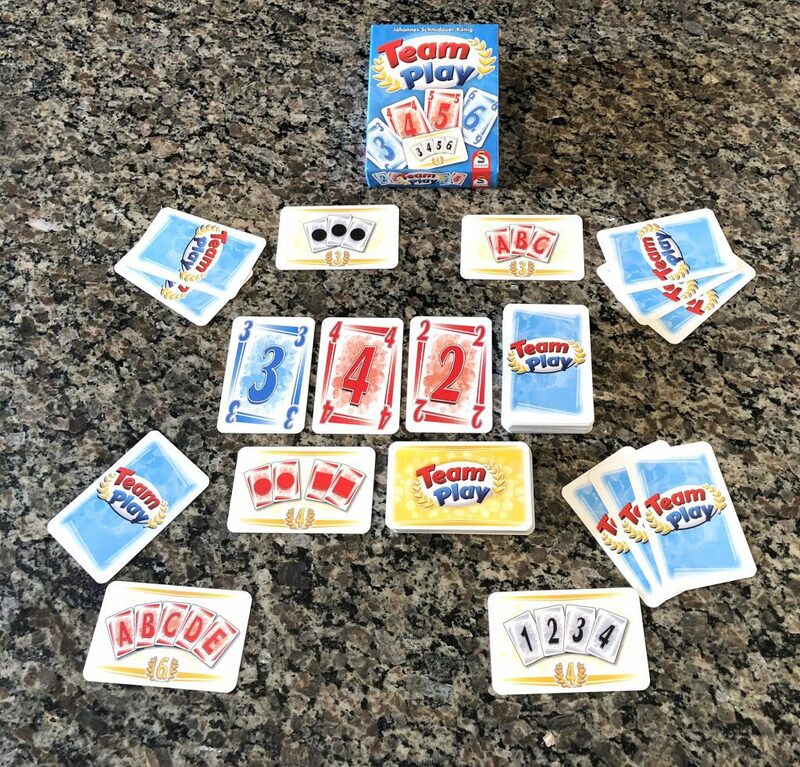 Just like No Thanks and 6 Nimmt, Team Play is simple to play, and a fun alternative to classic card games. I could go on, but there’s honestly not much more to say. 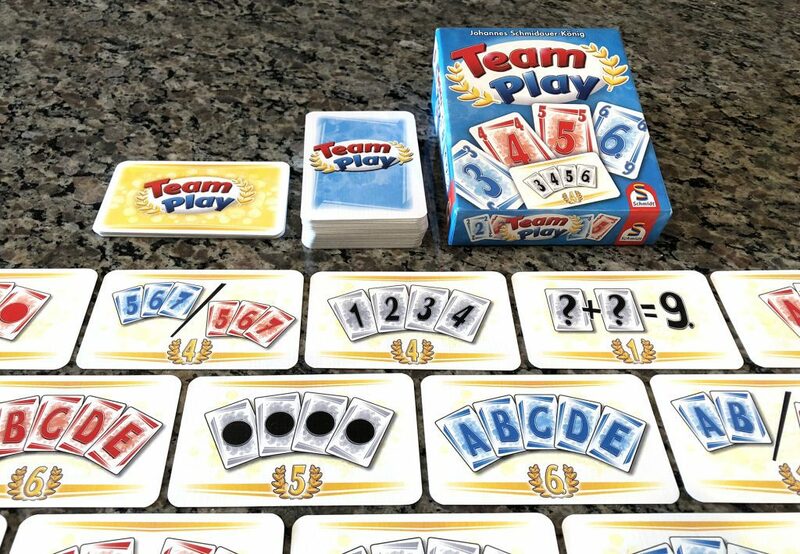 If you like small card games which pack a punch then Team Play belongs in your collection. Wiz Kids Games is bringing this small box card game to the states and it should be available in February. Welcome New Author – Elijah Longwell!